Commentary by Dr. Whitesel: I tell church leaders not to plant a church in the fall or launch a new service or venue at that time. That is because while there is a peak of interest in going to church before Thanksgiving, the time between Thanksgiving and Christmas is the lowest time of the year for people to be interested in attending church. It is much better to launch new multiplication efforts during Lent in the Spring run up to Easter as depicted in the chart below. 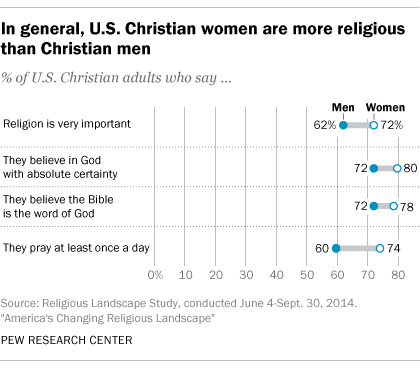 by Nobel Kuriakose, Pew Research, 5/18/14. 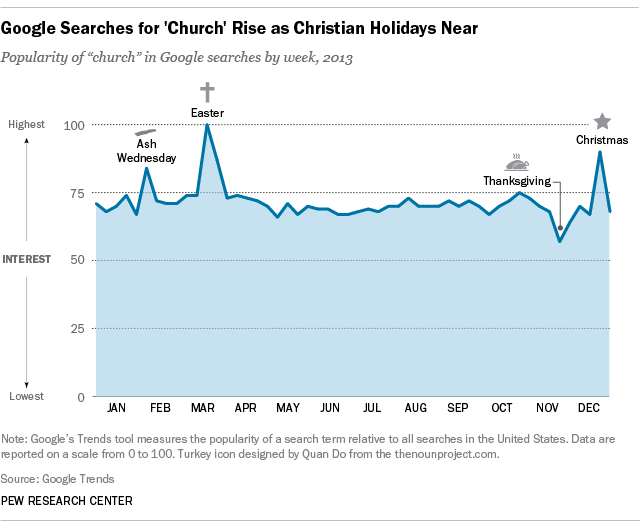 In 2013, the highest share of searches for “church” are on the week of Easter Sunday, followed by the week of Christmas and the week of Ash Wednesday, the day that marks the beginning of Lent. BIBLICAL ENTHUSIASM & Sadly it is declining in America like it has in Europe. But, there is something God can do through us to restore www.Enthusiast.life ! Commentary by Dr. Whitesel. Two of the best researchers on the church in America have pointed out in a recent article that enthusiastic Christianity is on the decline. I hate to hear this, but I believe we must understand the reasons why and petition the Lord of the harvest to show as ways to restore biblical enthusiasm. And I believe He can! Read this article citing research by colleagues Mark Chavez and David Voas and then let us look for ways to help people restore the enthusiasm that God intends for them to experience. Is American religion exceptional? Maybe, maybe not by Yonat Shimron Religious News Service, 11/19/18. … In an article published in Sociological Science last week (Nov. 15), David Voas and Mark Chaves, of University College London and Duke University, respectively, maintain that U.S. religious devotion may be higher than in other Western countries but it too is slowly declining and essentially no different from other developed nations in its growing secularization. Voas and Chaves counter that even the intensely religious segment of the American population is shrinking. Just as Europe has become more secular, so too has America, just at a slower rate. “The fact of the matter is, even on the intense religious category the U.S. is declining, if very slowly,” said Chaves, a professor of sociology and religious studies at Duke University. Both teams examined five indicators of intense religion: strong religious affiliation, more than weekly attendance at religious services, biblical literalism, affiliation with an evangelical religious group and praying multiple times per day. Voas and Chaves argue that between 1973 and today there’s been a significant drop in religious Americans’ responses in three key indicators: affiliation, the number of religious services people attend each week and their belief that the Bible is the literal word of God. For example, only 6.6 percent of Americans attended church more than once a week between 2012 and 2016, a drop from 8 percent in 1973. 31 percent said yes between 2010 and 2016, a drop from 35 percent between 1984 and 1990. Commentary by Dr. Whitesel: I often cite the valuable research in Duke University’s National Congregations Survey. MULTIPLICATION & Churches are starting more sites, but fewer worship services. CHURCH SIZE & Separation between smallest and largest churches widens. To access this study yourself, below is an introduction to the National Congregations Study and a link to the results. Congregations are the basic social unit of American religious life. They are the local gatherings of people that exist within almost every religion in the United States. They include churches, synagogues, mosques, and temples. Nearly all collective religious activity in America occurs through them. the main context in which religious identities are forged and reinforced through education and practice. The National Congregations Study (NCS) is an ongoing national survey effort to gather information about the basic characteristics of America’s congregations. The first wave of the NCS took place in 1998, Wave II was fielded in 2006–07, and Wave III was completed in 2012. The study was repeated in order to track both continuity and change among American congregations. Waves II and III also explore subjects that were not explored in Wave I. Over all three waves, a total of 3,815 congregations have participated in the NCS. There is no doubt that religious congregations are a significant part of American society. We know congregational life is changing, but it is difficult to document exactly what is changing in the 21st century, and how fast. The National Congregations Study contributes to knowledge about American congregations by collecting information about a wide range of their characteristics and programs across time. NCS results have helped us to better understand many aspects of congregational life in the United States. In all three waves, the research was done in conjunction with the General Social Survey (GSS). The 1998, 2006, and 2012 GSS asked respondents who attend religious services to name their religious congregation, thus generating a nationally representative sample of religious congregations. Researchers then located these congregations. A key informant at each congregation – a minister, priest, rabbi, or other staff person or leader – provided each congregation’s information via a one-hour interview conducted either over the phone or in person. The survey gathered information on many topics, including the congregation’s leadership, social composition, structure, activities, and programming. Using this web site you can review the survey methodology and the questionnaires themselves (Methodology), work with the survey responses to find out the basic facts for each question (Explore the Data), create your own customized tables that cross-tabulate responses to two different questions (Explore the Data), and learn where you can find more extensive writings about the research results (Study Writings). You can also download the combined data from the Association of Religion Data Archives (ARDA). Both waves have been combined into one dataset for ease of use. by Justin McCarthy, Gallup, 6/1/18.. These data are from Gallup’s annual Values and Morals poll, conducted May 1-10. Views of the direction of the country’s morals were slightly more negative from 2006 to 2008, however, when 81% to 82% said the state of moral values was declining. TRENDS & Liberal religions’ loss has not been our gain. Conservative religions, at best, used to hold steady as a percentage of the population; now we are not even doing that. by Jana Riess, “Flunking Sainthood,” 5/8/18. … For a long time, the strict-religions theory seemed to explain a great deal, at least in the United States: in the 1980s and 1990s, conservative religions were indeed thriving even as mainline Protestantism’s numbers went down the toilet. More recent work has called this into question, driven by the reality that almost all religious traditions are now struggling — even conservative ones like evangelical Protestantism and Mormonism, which once seemed so reliably immune.
. . . secularization theories argue that as the United States becomes more secular, religious attachments will become less important. Hence, secularization proponents expect to find that nonaffiliation is increasing, that religious switching is more common, and that more fundamentalist and exclusivist religious groups will decline or only increase through fertility differentials. And that is indeed the case: all three of those factors he mentions are now happening. If supply-side theories alone could explain why liberal religions seemed to decline in the 1990s and beyond, Sherkat argues, we would see evidence that the exodus from liberal traditions such as mainline Protestantism was matched by a corresponding growth in conservative religions that was not already due to those religions’ higher fertility – and the data don’t show that. That’s not to say that the secularization theorists have it all right, either; Sherkat says their “grand, linear, evolutionary perspective” of religious decline “is just as far-fetched as the supply-side stories yearning for a sectarian Christian America.” Rather, religious decline is related to broader demographic patterns that are complex and ever-changing, from declining fertility and immigration to generational replacement. A big part of the problem is that Americans are having fewer kids. Some argued that [mainline Protestantism declined because] people wanted strict churches and these had become too lax. The better evidence, though, showed that nearly all the decline in mainline denominations was attributable to demographics. Mainline members were better educated and more likely to be middle class or upper-middle class than the rest of the population. As such, mainline members married later, had children later, and had fewer of them. Memberships declined because there were simply fewer children being born into these denominations. Evangelical Protestants, meanwhile, escaped these demographic problems. As long as they kept marrying young and having large families, their growth would make up for the mainline losses. There is just one problem: the same demographics that caused problems for mainline churches are now prevalent in the whole society. To sum up: liberal religions’ loss has not been our gain. Conservative religions, at best, used to hold steady as a percentage of the population; now we are not even doing that. Instead, the real growth has been in nonaffiliation, as people are no longer switching religions so much as dropping out altogether. About 7% of Americans claimed no religious identification in the early 1970s, when the General Social Survey began tracking it. In 2016, according to PRRI, that group (the “Nones”) had nearly quadrupled to 26% of the U.S. population – and there are signs it will only accelerate through cohort replacement. As you can see from the infographic up top, among younger Millennials in 2016, 39% had no affiliation. by DALIA FAHMY , Pew Research Fact Tank, 4/6/18.